The peroneal tendons are located on the outer side of the foot and ankle. The tendons begin where the peroneus brevis and peroneus longus muscles end in the lower leg, as the tendon is the attachment of the muscle to the foot. These two tendons then run together behind the outer ankle bone, and eventually split up. The brevis tendon, which is shorter, attaches to the outside of the base of the 5th metatarsal, which can be felt as a bone bump midway along the outside of the foot. The longus tendon, which is longer, dives underneath the bottom of the foot and attaches to bones in the middle section of the bottom of the foot. The purpose of these tendons is to rotate the foot outward, as a direct opposition to strong tendons that rotate the foot inward on the inner side of the foot. This function is vital to the preservation of proper walking. 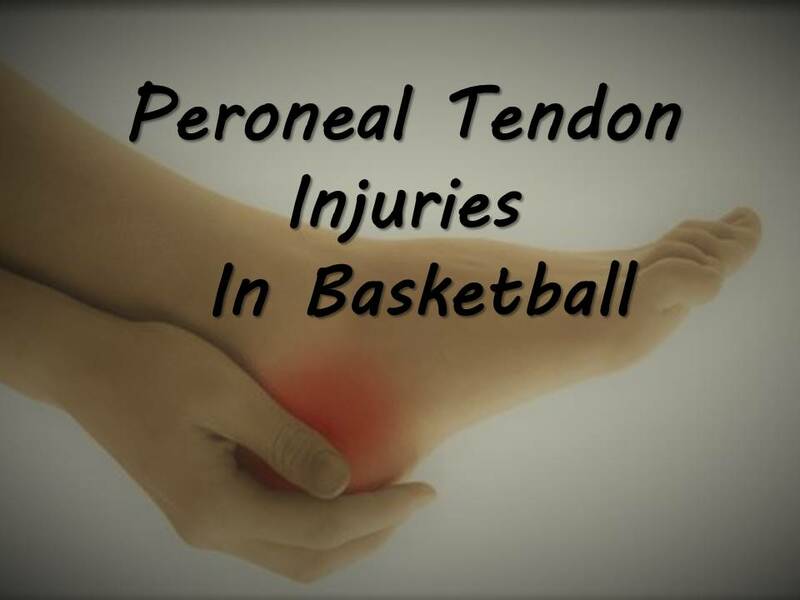 The tendons can become injured in basketball due to a variety of reasons. Ankle sprains that force the foot inward can stretch and strain one or both of the tendons, while more serious sprains can actually tear the tendons. Poorly supportive shoes or over training can lead to the same strain. Once the tendon becomes inflamed or partially torn, a chronic process can begin that leads to further tendon damage, tendon weakness, and even further splitting of the tendon material. As a result, the ankle can even weaken as the ligaments on the outside of the ankle become strained due to the weakness of the peroneal tendons. Symptoms of peroneal tendonitis can vary, but nearly always involve some form of pain to the outside of the ankle or foot. This can be an aching pain, a sharp pain, or even a shooting pain up the leg. The pain is worsened when the ankle is turned inward, or the foot is purposely moved upward and outward. Activity will worsen the pain, and in advanced cases pain can even be seen at rest. The foot and ankle may feel weak, and unstable on uneven ground. Swelling and warmth to the outside of the foot and ankle can also be present. Other conditions can cause similar symptoms, including nerve inflammation, 5th metatarsal bone fracture, ankle sprains, and joint damage or inflammation. A foot exam by a podiatrist will help rule these other conditions out. Treatment of peroneal tendonitis involves reduction of the inflammation and support of the foot and ankle to allow for complete healing. Anti-inflammatory medication, elevation, activity rest, and icing all contribute to the reduction of the inflammation. Injections of steroid compounds around the tendons can be performed, but caution must be exercised as the steroid compounds can weaken the tendons and possibly cause a rupture. At the same time as inflammation reduction, the ankle must be supported to reduce strain. This can be accomplished with an ankle brace, or with a fracture boot in advanced cases. Often, physical therapy can be employed to reduce inflammation and strengthen the tendon integrity. If these measures are not helping, or if a more severe injury is initially suspected, an MRI will be taken to evaluate the tendon substance. Reparative surgery is used when the damage is severe, or if the tendon is not healing with the above measures. This involves repair of any torn or degenerative tendon segments, along with augmentation of any weak tendon areas with graft material. The long term success of all the above measures is fairly high, although some people require long term support with prescription shoe inserts (orthotics) or ankle braces to prevent re-injury.